Continuing DMA’s global travels in 2018, David Miller was invited to take part in Turkey’s Archisections conference on 19th October in Istanbul as one of the keynote speakers. Eco-friendly buildings can be operationally more efficient by using less energy and water resources, thereby reducing carbon emissions and provide a healthier living space for residents, employees, businesses and the community. And, since buildings have an estimated 30 per cent share of global carbon emissions, greener buildings provide one of the most economical and effective solutions in tackling climate change. Turkey has a goal to reach 15 million square meters of new green building space over the next five years, reaching out to the international community for solutions in this endeavour. As a relative newcomer in the sustainable buildings sector, the ArchiSections conference, supported by the Tourism and Culture Ministry, invited a host of the world’s leading architects to present case studies that would showcase what can be achieved in the demand for a greener built environment. With a broad selection of delegates, including many Turkish students, the organisers, Ceylan Pirinccioglu of VIP Events, and Sevinç Ormancı of Sedeko Architecture, generated a great deal of enthusiasm and were inspiring everyone to drive forward sustainable themes by looking beyond their borders, illustrated by the varied and international speakers they sourced. 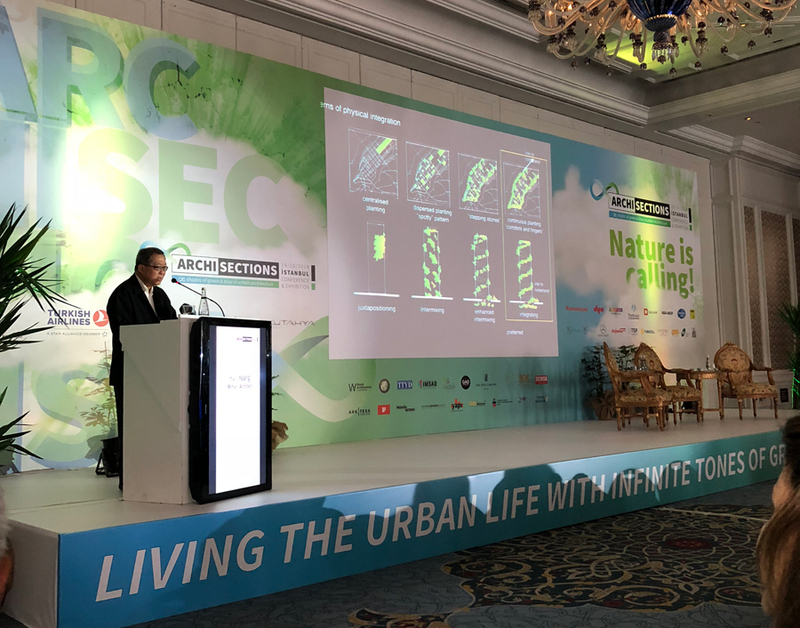 The conference, hosted in the opulent and spectacular Çırağan Palace began with the first keynote speaker of the day, the architect, ecologist, planner and author from Malaysia, Ken Yeang who has a holistic view of buildings being part of nature. His distinctive green aesthetic, working on the theory and practice of sustainable design led to the Guardian newspaper declaring him in 2008 as “one of the 50 people who could save the planet”. His presentation, detailing the trends in sustainable buildings was well-received by delegates and provided a deep insight into how Turkey could adopt his expertise. This incredible conference, with a host of expert speakers from Turkey including Gökhan Avcıoğlu of Gad Architecture, Sevinç Ormancı, of Sedeko Architecture and Prof. Dr. Süha Özkan outlined the high quality of work taking place in the country. It was also interesting for David to hear about other projects happening around in the world. In particular, the architects from Los Angeles (Joseph Coriaty, Michael Lehrer, and Mia Miriam Lehrer) were discussing the futuristic LA Sustainability Plan- a roadmap for a cleaner environment and a stronger economy which could be implemented in cities globally if the appetite is there. David’s talk focused on how it’s possible to use digital tools to assist in achieving real-world sustainability by reducing waste through utilising BIM and improved efficiency using integral design and offsite factories. He talked about the inventive reuse of historic buildings including the latest laser-scanning technology, using the Anstey Hall Barns project as a case study for historic fabric. The Media Centre at the Lord’s Cricket Ground was used to explain improved efficiency, the Mayfield School project used to highlight how to marry BIM and offsite manufacturing, and the Orchard Village project used as a case study in offsite manufacture and mass customisation. It was clear to all at the conference that Turkey has enthusiasm and an appetite for sustainable development. With a population of almost 17 million, they face real infrastructure and transport challenges but realise the opportunities available from the Bosphorus to address transportation issues in a sustainable and eco-friendly manner. The sustainability agenda in Turkey reaches further though. As one of the largest and culturally significant cities in the world, they realise that Istanbul is a precious jewel in their crown. Through the work with the UNESCO Creative Cities Network, innovation and creativity are now the main components of Istanbul’s vision and recent policies. This latest conference has helped to educate and inform future policies to ensure sustainability remains at the heart of the city, and we are proud to have played a part of that aim.